As efforts to alleviate the most pressing societal woes gather pace across the world, social investment presents a pathway towards sustaining such efforts by leveraging on the increasing private wealth for social good. AVPN defines social investment as encompassing an array of highly engaged grant-making and investment that combine tailored financing instruments with nonfinancial support for nonprofits and social enterprises. 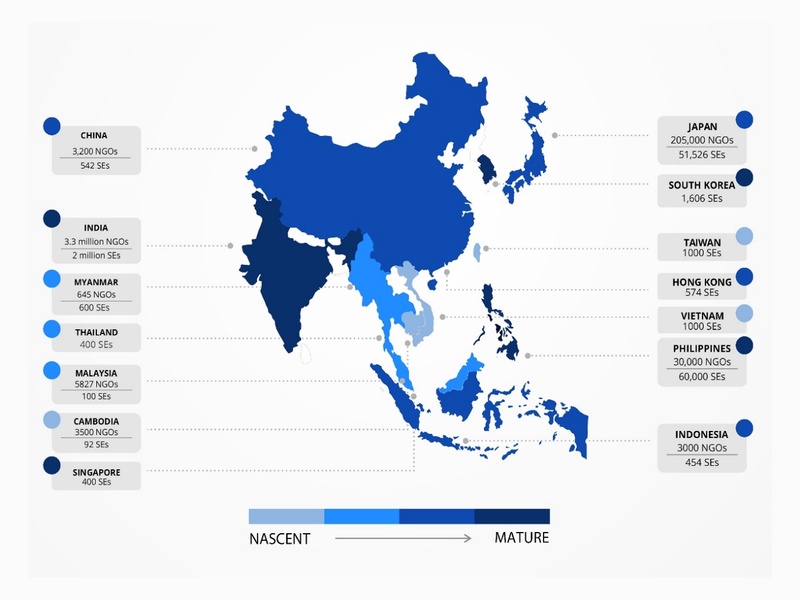 The Landscape is a holistic study of the current Asian philanthropy and social investment ecosystem across 14 markets in North, South and Southeast Asia. For each market, the report identifies development gaps mapped to the UN Sustainable Development Goals (SDGs) and shares how the government is currently addressing these gaps. It goes on to analyze the social investment landscape, including legislative environment and a unique ecosystem map that outlines the key players in each of the 14 markets – from foundations, impact funds and corporates to crowdfunding platforms and incubators. Each country snapshot concludes with opportunities, challenges, and recommendations for social investors whether they are looking to make a grant or a more market-based investment to drive impact. The progress made by individual countries towards SDG goals and targets serves as the starting point for each country snapshot. As progress made towards the 17 goals varies, the SDG dashboard indicates areas where social investors can create the most significant impact, both geographically and cause-wise (see Figure 1). It is evident from the SDG dashboard that while emerging economies such as India, Cambodia, Myanmar, Indonesia, Philippines, and Vietnam have to address challenges in water and sanitation, healthcare, and education, developed economies have their share of social problems too. For the latter, this includes aging woes, growing inequalities, declining workforce, labor productivity and in some cases, gender inequality. In addition, the general consensus is that environmental issues remain uniformly problematic across countries. While the social economies in Asia differ in their levels of maturity (see Figure 2), examples of social investors working towards SDG goals and targets are seen across the board. (iii) Employment for youths in Amagasaki city. SIBs have also gained notable traction in South Korea. Often hailed as one of the four East Asian ‘tiger economies’, South Korea is also one of the most advanced social economies in Asia according to our findings, having enacted the Social Enterprise Promotion Act in 2007 that provides a legal structure and a host of support measures for social enterprises. In 2014, the Korea Social Investment Fund (KSEF), the Department of Women and Family Policy, and the Seoul government partnered to launch a social impact bond (SIB). The proceeds from the bond are being used to provide welfare services to underprivileged children to improve their social outcomes, thereby reducing inequalities in the society. With the launch of SIBs in Japan and South Korea, there are more opportunities for investors outside Asia to contribute towards the achievement of the SDGs in the region. Hailed for its growth potential, India is, nonetheless, mired by a specific set of societal challenges, exacerbated by regional imbalances. Philanthropic foundations are adopting venture philanthropy approaches to meet the SDGs. This includes Tata Trusts with a variety of specializations, such as education, healthcare and nutrition, rural livelihoods, and natural resources management. Edelgive Foundation, on the other hand, primarily invests in women empowerment, livelihood, and education, while Bharti Foundation’s primary emphasis is on the education sector. Further, India registers a vibrant impact investing landscape with a variety of international investors active in the country. As of 2016, USD 1.6 billion of capital was invested in 220 impact enterprises of various growth stages, with high investment concentration in Western and Southern India. Healthcare, agribusiness, clean energy and financial inclusion are the leading sectors. When it comes to social investing, HNWIs in India allocate over 40% of their portfolio. Whether it is taking the venture philanthropy or foraying into impact investing, Indian philanthropists have significantly broadened the array of philanthropic engagements along the SDGs. The Philippines has one of the most vibrant social economies in Southeast Asia, largely driven by a proactive civil society. The country has established several innovative approaches to social investment such as debt swaps for development, pooled CSR funds, and highly engaged family foundation establishments. Support for social enterprises has been strengthened in recent years as demonstrated by the Poverty Reduction Through Social Enterprise (PRESENT) bill currently pending in the Senate. The country’s approximately 300,000 social enterprises - broadly defined to include revenue generating NGOs, cooperatives, fair trade groups and microfinance institutions - permeate a wide array of SDGs including education, health, agriculture, women empowerment, with a few of them having achieved national scale such as Rags2Riches, Bagosphere, Hapinoy, Human Nature and Gawad Kalinga. In addition to venture philanthropy that is taking root among local foundations, Philippines is also one of the most active impact investing scenes in Southeast Asia, with LGT Impact Ventures, IIX, Omidyar, Unitus, Rare being some of the most notable investors. Despite operational restrictions imposed on nonprofits, Vietnam increasingly recognizes the potential of social entrepreneurship in tackling the societal issues it is facing. It is the only Southeast Asian that legally recognizes social enterprises as part of the Enterprise Law. While its social economy is still in nascent stages, there has been a proliferation of homegrown impact funds working to build the ecosystem alongside international investors such as Patamar, Insitor, PhiTrust. Dragon Capital’s Mekong Brahmaputra Clean Development Fund, for instance, focuses on renewable energy, energy efficiency, water conservation and waste recycling. Evergreen Labs develops and support agribusinesses and community-based tourism. Ecosystem building initiatives are also picking up steam. Lotus Impact, for example, is working with Villgro and USAID to set up an incubation and investment program alongside new local angel investor networks, such as the Mekong Angel Investor Network. Such efforts are expected to broaden support available to the country’s around 1,000 social enterprises that are active in education, vocational training, healthcare, rural livelihoods and environmental protection. In South Korea and Japan, gender equality, and elderly care are pressing issues that have not gained significant traction. On the other hand, India is still lagging behind in terms of energy access, food security, and regional inequalities. Indeed, investment in the North-eastern, Northern and Eastern parts of the country is still low compared to Western and Southern regions. The Philippines and Vietnam needs more targeted attention in issues such as energy access, agriculture, and community development. Most worryingly, environmental protection is still an underfunded area across most, if not all, 14 social economies in Asia. While different countries are grappling with their own set of societal issues, the SDGs provide a comprehensive, far-reaching and right-based set of universal goals and targets that collectively shape a sustainable, equitable and resilient future for all nations regardless of their stages of development. They encompass the three interrelated dimensions of sustainable development: economic, social and environmental. 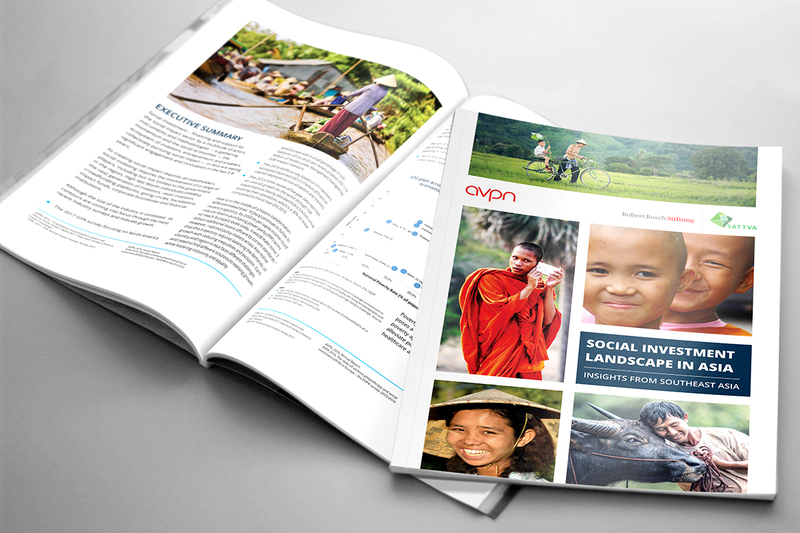 Recognizing this, AVPN’s Social Investment Landscape in Asia helps social investors to direct their efforts towards the SDGs. By deploying capital to address high-gap SDGs, investors will be able to maximize impact where it is most needed. The emergence of different approaches including venture philanthropy, impact investment and SIBs in Asia presents a variety of ways in which social investors outside Asia can maximize impact in the region. Further, with Programme-Related Investment (PRI) and Mission-Related Investment (MRI) gaining significant momentum, Asia presents a wide array of opportunities for foundations in the US and elsewhere to make a difference where social investment is most needed. For more details, check out the full 2-book report here.